Everton's teenage defender John Stones is worthy of a gamble in England's World Cup squad, according to former Three Lions captain Gary Lineker. Stones, 19, could be in contention for a standby place when boss Roy Hodgson names a 30-man party on Monday. Injury fears over Manchester United's Phil Jones may boost his chances. 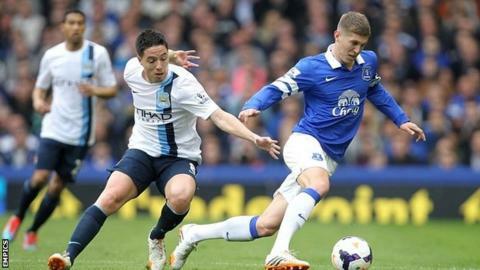 "The one I might take a chance on because we are short in central defence is Stones," said Lineker. "I really like him and he has got a lot about him." The BBC Match of the Day presenter added: "Sometimes central defenders need a little bit more experience than players in other positions because of the extra discipline and the nature of that particular role. "But is he worth a gamble? Well, if Roy loses another one - if Jones doesn't make it for example - then what else have we got?" Gary Cahill and Phil Jagielka are England's first-choice pairing, but Lineker does not think there are many more obvious contenders, arguing that Cardiff's Steven Caulker "struggles a little bit on the turn". The former Everton striker, who scored 48 international goals in 80 appearances for England, added: "We are short in that position." England under-21 international Stones was playing for Barnsley last season before a £3m move to Goodison Park in January 2013. The Yorkshire youngster has made 26 appearances in an impressive season at the heart of Everton's defence and can also play at right-back. Manchester United's Jones suffered a shoulder injury in Tuesday's Premier League win over Hull, while Tottenham defender Kyle Walker has been out for the past two months because of a pelvic problem. Everton's Jagielka has only just returned from two months on the sidelines with a hamstring injury. Hodgson will name his 30-man squad on Monday. It will include seven players on standby in case of injury.